L.A.’s torta scene has blossomed only just recently, and I’ve finally found a handful of outstanding regional Mexican sandwiches from D.F., Jalisco, Puebla, and even a homegrown-style worthy of recommending to all of you torta lovers. Besides the great sandwich artists now behind these grills and counters, the biggest change has been the bread; there are just far too many run-of-the-mill stands and restaurants serving tortas on those soft, sweet telera rolls. But our best vendors have gone the extra length to obtain the genuine product. Which brings me to the subject of the lonche, a lesser known sandwich that’s more popular in the Jalisco region. The lonche is all about that amazing, hard, crusty bread—it’s salty in Guadalajara, more balanced with sweetness in the highlands—and the rich, flavorful cream that anoints each sandwich, drawing in the simple cold cuts, pickled chilies, and chile de arbol sauce. Many of our Jaliscan torta ahogada restaurants offer lonches that are merely dull tortas, and Lonches Marlene, last seen in 2013, has vanished. 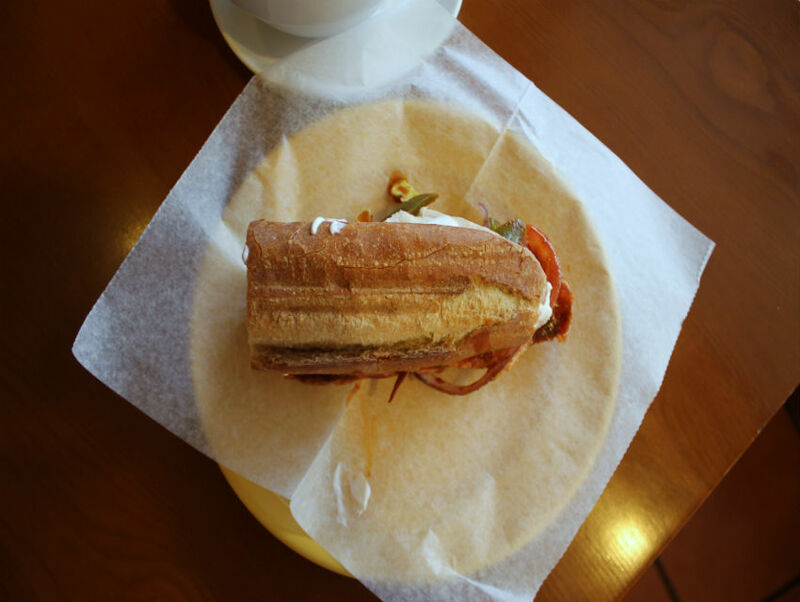 But the Boyle Heights coffee shop, Primera Taza, has stepped up to fill the void, with a lonche made from authentic ingredients and handmade products that rival our best tortas in town. The wife of Primera Taza co-owner, Chuy Tovar, Rosalinda Hernandez, has added a handful of lonches to the menu including a lonche de lomo with a homemade adobo-marinated pork tenderloin, sliced thin and served cold, and a lonche de panela made with salted cheese curds. The birote, a baguette-like sourdough roll, carried by the Boyle Heights coffee shop is delicious on its own, but when layered with pork, salsa, pickled jalapeños, thin-sliced avocado, and cream, it all comes together in your mouth like a mariachi pick-up band of virtuosos. Be sure and check their Instagram, @primerataza, or call in advance to check availability, because once the bread is gone, Elvis has left the building. Well, you can get their Elvis sandwich in that case.